The Man Ray–Human Equations: A Journey from Mathematics to Shakespeare exhibition at the Phillips features mathematical models that the artist took photographs of, and which later served as inspiration for a series of paintings. Once this group of paintings began to expand, Man Ray titled them after Shakespearean plays, including the work below, Hamlet. The mathematical model that inspired this painting is called a Meissner tetrahedron. What’s special about this shape is that it’s movable in every direction without leaving its “nest,” or the two parallel supports that keep it in place. Its curves inspired Man Ray to re-create the shape in a way that explores its connection to the appearance of the human form. The photograph he produced in 1934-35 was altered in such a way that it resembles a female breast. So how does this connect to the play Hamlet? Shakespeare’s lead character in the production, the fictional Prince of Denmark, has a very strange relationship with the two main female characters—his mother Gertrude and his “girlfriend,” Ophelia. Could this breast be one of Ophelia’s, or is it a reference to the slight Oedipal complex Hamlet has for his mother? It’s up to the viewer to decide! 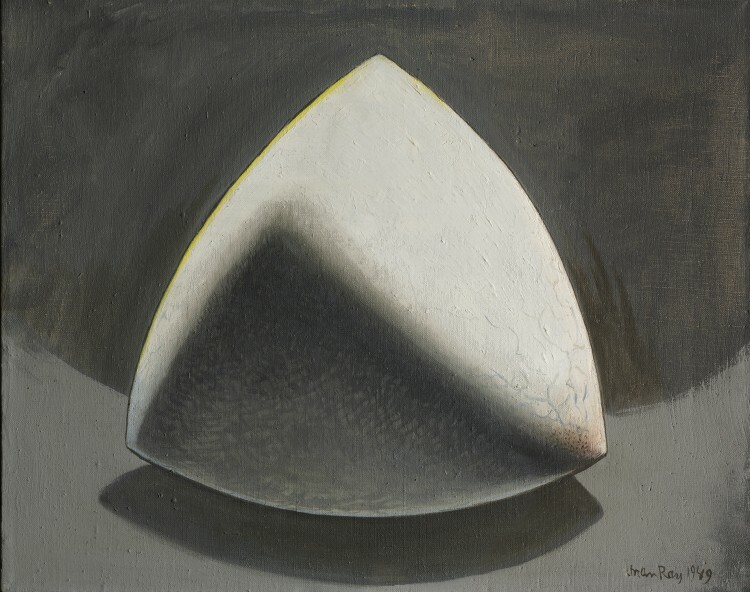 This entry was posted in Exhibitions and tagged anthropomorphism, anthropomorphize, Hamlet, humanize, Man Ray, mathematical models, Meissner tetrahedron. Bookmark the permalink.